Dagenais, Maxime. "Hunters' Lodges". The Canadian Encyclopedia, 27 April 2017, Historica Canada. https://www.thecanadianencyclopedia.ca/en/article/hunters-lodges. Accessed 22 April 2019. Based on the Lower Canadian Frères Chasseurs, Hunters’ Lodges were American secret societies that aimed to liberate the Canadian colonies from the tyranny of British thralldom. With estimates ranging from 15,000 to 200,000 members, lodges counted on much support from borderlanders, from Maine to Wisconsin, who were disillusioned and frustrated with the social, economic and political changes that shook 1830s America. Though they failed to liberate Canada, losing key military encounters near Prescott and Windsor in November and December 1838, their importance was significant enough that they had forced the American president, Martin Van Buren, to send a military force to the American-Canadian border to ensure that the neutrality between the United States and Britain was strictly followed. For months, Hunter activities dominated American foreign and internal policy. 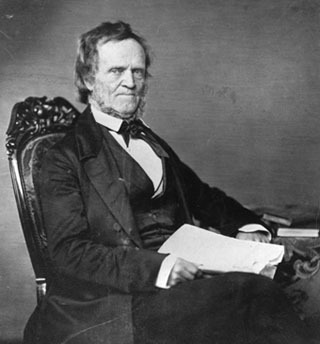 In the aftermath of the failed 1837 Rebellion, several rebel leaders, such as Ludger Duvernay, William Lyon MacKenzie and Robert Nelson, sought refuge in such American border towns as Burlington, Buffalo, St. Albans and Watertown. All along the borderland, Americans welcomed the Canadian rebels with open arms. Public meetings and demonstrations in their favour were held in numerous towns and villages and locals provided the refugees with shelter, food, money, supplies and weapons for their fight against the British. Many others also volunteered to fight for Canadian freedom. Throughout Michigan, Vermont, New York, Maine, Ohio, and even in Kentucky and Wisconsin, Americans joined secret societies known as Hunters’ Lodges, aimed at liberating the Canadian colonies from the yoke of British tyranny. 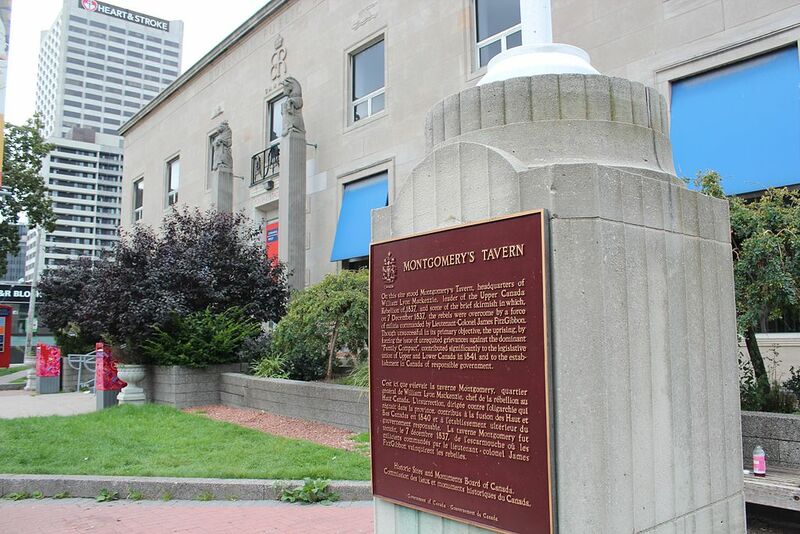 The historic plaque marking the location of Montgomery's Tavern in Toronto, the scene of fighting between rebels and government forces during the Rebellion of Upper Canada (pictured in 2013). 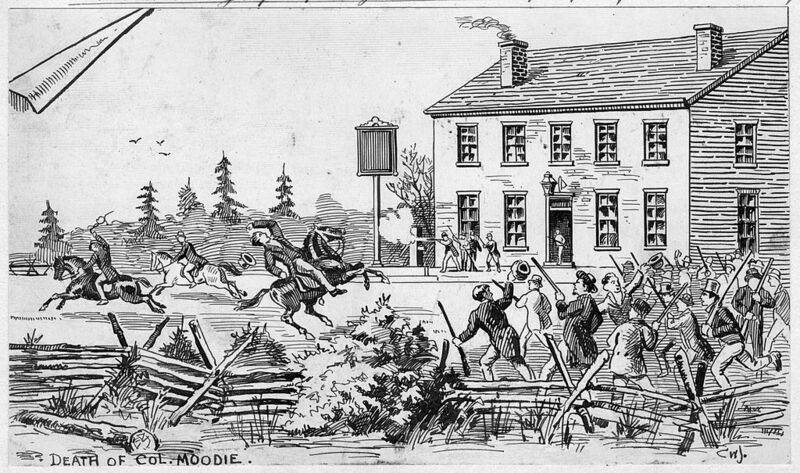 A pen and ink drawing by Charles William Jefferys, showing the skirmish outside John Montgomery's tavern in Toronto on December 4, 1837, during the Rebellion in Upper Canada. American Hunters’ Lodges were based on a patriotes secret society — les Frères Chasseurs—that were first organized by Robert Nelson and the Lower Canadian rebels exiled in St. Albans, Vermont. Though most historians insist that the Frères Chasseurs were founded in February 1838, following the failed patriote sinvasion of Lower Canada, Julien Mauduit has recently uncovered evidence suggesting that they were founded as early as December 1837 in Plattsburgh, NY. Nonetheless, by September 1838, there were 35 loges (or lodges) in Lower Canada, each aiming to defeat the colonial government and establish a Lower Canadian republic. As these lodges spread west throughout the American borderland, they were organized and populated by Americans and were named after their Lower Canadian counterpart (chasseur is hunter in English). Lodges were organized all over the borderland with grand lodges in St. Albans (Vermont), Cleveland (Ohio), Rochester (New York), Buffalo (New York) and Detroit (Michigan). Putting a number on the membership and size of the Hunters’ Lodges is almost impossible. Like many secret societies, they left historians with little written evidence. There are hints, however, as rough estimates from contemporary sources range from 15,000 to 200,000. Most historians agree that it is unlikely that 200,000 joined the ranks of the Hunters’ Lodges, and even if 200,000 did take the oath, the vast majority would have done so in name alone, with no intentions of actually fighting the British. However, their numbers were important enough that Martin Van Buren sent a military force to the Canadian border to stop them from injuring the neutral relations with Great Britain. In fact, support for the Hunters’ Lodges was so widespread, including members of the local elite, that military officers sent to stop their activities felt completely helpless. Historian Thomas Richards, Jr. noted, for instance, that military generals often complained that they were powerless in the region because so many civil officers favoured the Hunters. Even state militias generally supported the rebels, with many militiamen joining the lodges. General Winfield Scott, who was sent to preserve peace along the border, complained that most militias were “infected” with rebel sympathizers. Very few Hunters left any written evidence explaining why they joined Hunters’ Lodges; they took an oath of secrecy and when the movement failed, or more importantly was outlawed, many, it is assumed, hid their past associations with the movement. Historians, however, have pointed to numerous reasons why Americans would join: from an idealistic belief in Canadian independence, to the remnants of anti-British sentiment, to profiteering and even to a sense of adventure. Some probably even joined for the camaraderie. Two historians have provided new and intriguing interpretations. According to Andrew Bonthius, some Hunters may have joined as a result of deep-seated frustrations with the social and economic tensions that resulted from the Market Revolution. Examining the rise of Hunters’ Lodges in Ohio, Bonthius suggests that these lodges gained much of their supporters from radical Democrats — also known as the Locofocos — who were actively resisting the transformation from an agrarian economy of small producers to one of “possessive individualism where all human and social relations turned on exchange values rather than use values.” Bonthius sees the same struggle playing out in Canada, eventually leading to the Rebellions. The Rebellions, known in the United States as the Patriot War, offered these radical Democrats with the theatre to express their frustrations. 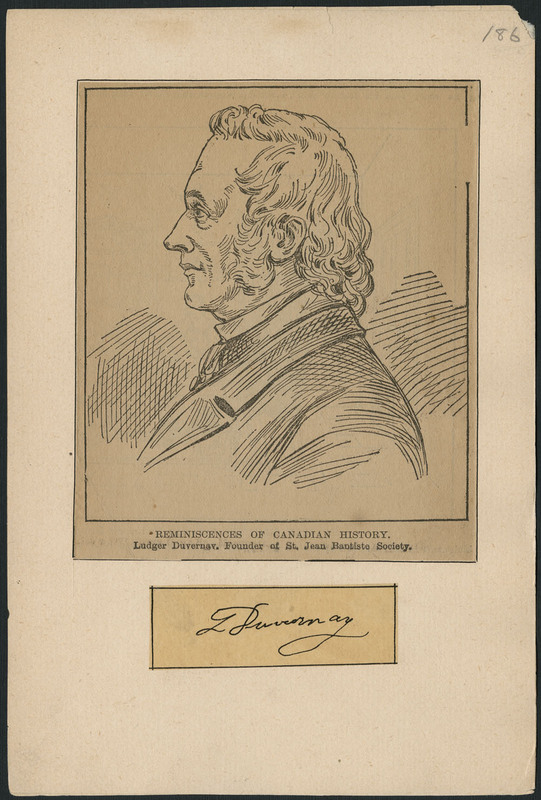 In what he calls “the lure of a Canadian Republic,” historian Thomas Richards, Jr. similarly suggests that major changes in American geopolitics pushed many to join lodges. 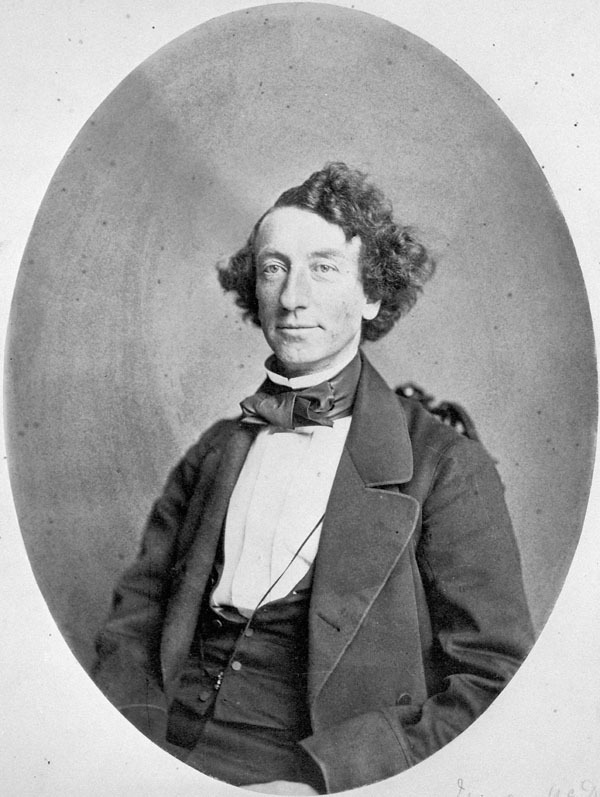 However, unlike Bonthius, Richards suggests that these men did not merely join as a means to express their frustration, but they had a specific goal in mind: they sought the creation of an Upper Canadian republic that was a political, economic and social alternative to a United States that they had grown alienated with. Following the changes caused by the so-called Market Revolution and the financial hardships caused by the Panic of 1837 — a financial crisis that caused a major depression in the United States — Americans sought to create a republic, outside of the United States, where they could obtain political and financial power, which seemed impossible in the United States. 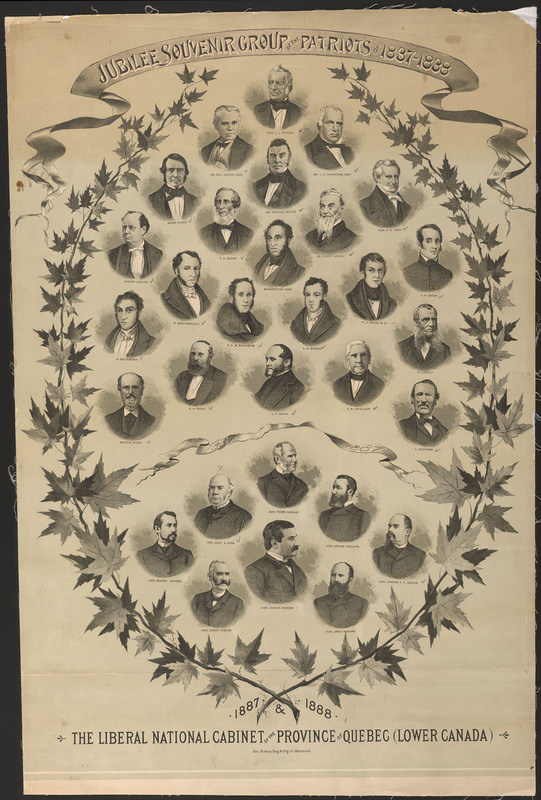 The Canadian Rebellions offered these individuals the opportunity to create this republic. Such paramilitary activities on the borderland climaxed in November and December 1838 when two separate forces invaded Upper Canada. On 12 November, 250 Hunters attempted to land at Prescott, but were pushed away by the local militia. 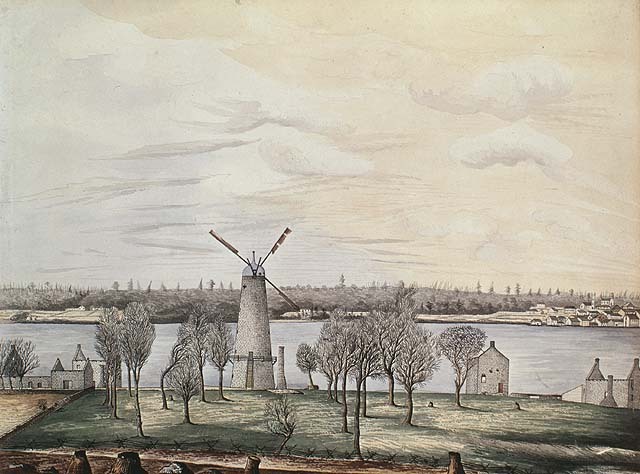 Forced upriver, the Hunters landed at Windmill Point, three kilometres east of Prescott, and set up camp at the local windmill. The windmill offered the invaders great defences and a perfect view of the horizon. The next morning, 600 militiamen marched on the windmill, but were pushed away by the Hunters. 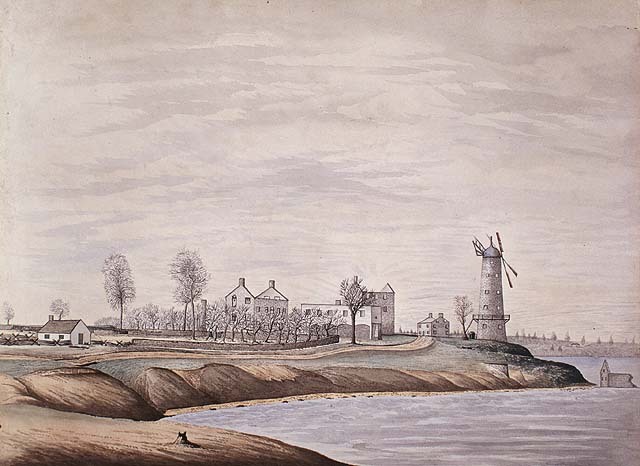 A few days later, on 16 November, a larger force of British and American regulars surrounded the windmill. With heavy artillery falling on their position, no reinforcements in sight and casualties mounting, the leader of the invasion party, Nils von Schoultz, surrendered, ending the Battle of Windmill. Von Schoultz was arrested and later executed for his actions. 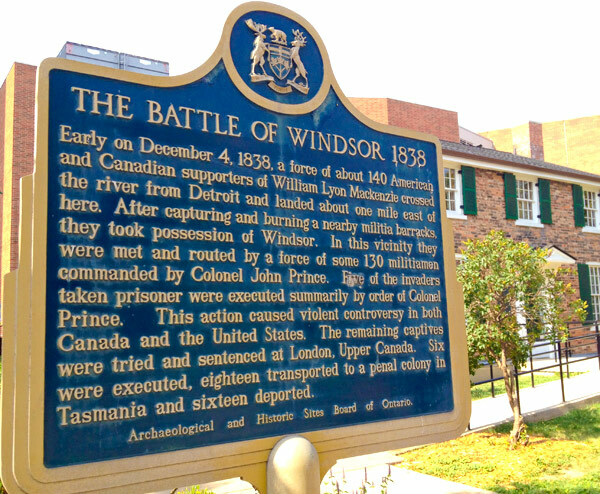 The final major military campaign undertaken by the Hunters was in the Detroit-Windsor area in December 1838. In the early morning of 4 December, at 2 a.m., a group of about 135 Hunters crossed the Detroit River, landing near Windsor. There, they torched a few houses, British barracks and a British steamer. The bulk of the British force — which was 500 strong — was stationed just a few miles south. Hours later, at 7 a.m., a detachment of this larger force marched to Windsor and easily dispersed the Hunters, putting an end to major Hunter activities on the borderland and an end to the Rebellions. 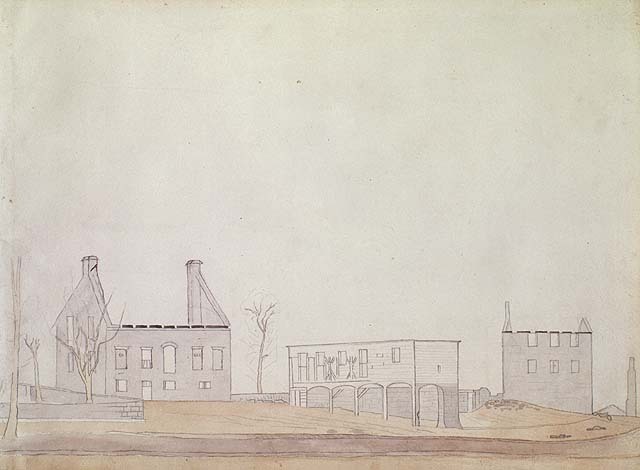 A painting of the original Brock's Monument prior to the 1840 bombing (painting by Philip John Bainbrigge, courtesy Library and Archives Canada/ C-011799). 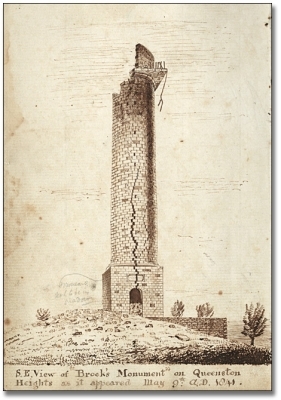 A drawing of the damage inflicted on the original Brock''s Monument by Benjamin Lett on 17 April 1840. 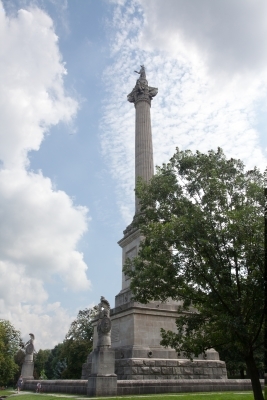 Brock's Monument, Queenston Heights. The present-day 56-m structure, designed by architect William Thomas and erected in 1853, underwent a substantial restoration process and reopened in 2010 (photo by James Marsh). 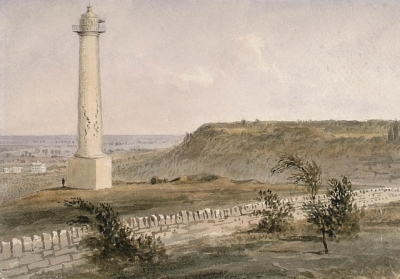 These defeats did not spell the end of Hunter’s Lodges; some maintained that the United States and Great Britain could still be pushed to war and there was the occasional incursion into Canada – such as at Queenston Heights where Hunters are said to have destroyed the Sir Isaac Brock Monument in 1840. Still, Hunter activities were limited, and by 1842 the groups had disbanded. 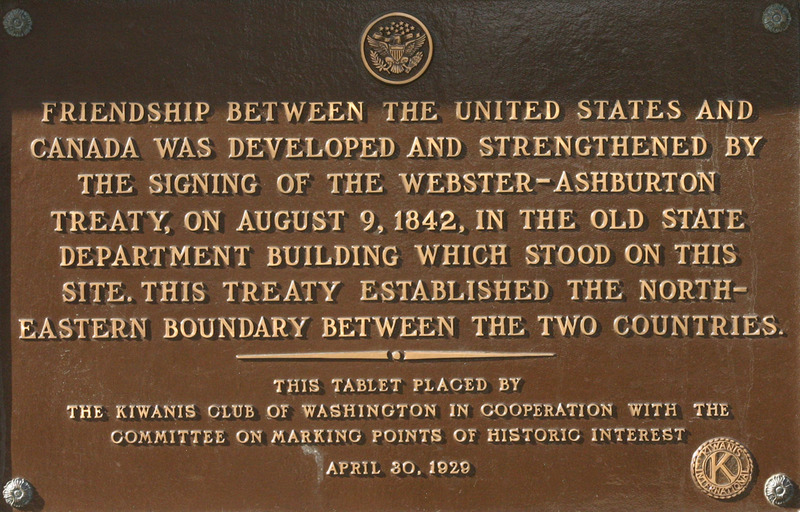 Internal pressures from President John Tyler (ordering them to disband), and the end of British-American tensions that followed the signing of the Webster-Ashburton Treaty, made the lodges unnecessary and obsolete. In general, the Hunters’ Lodges failed. They not only failed to free Canada from British thralldom, or to establish a Canadian republic, but they failed to provoke a war between the United States and Great Britain. Instead, they had the opposite effect: they galvanized the American government (and public) to defend the peaceful relations between the two countries. They pushed the American government to declare war on the Hunters’ actions, called for their arrests, sent a military force to the borderland to stop their activities, and cooperated with British authorities to end their Canadian invasion. Nevertheless, Hunters’ Lodges made an imprint on the United States, and for over a year, they were a phenomenon on the borderland. According to recent studies, these lodges (along with the rebellions) offered an opportunity for Americans who were disillusioned with the changes to the United States to express their frustration or seek better alternatives outside the United States. Though historians still do not have a definite number on the size of the lodges, they were important enough to have had a real impact on American internal and foreign policy. 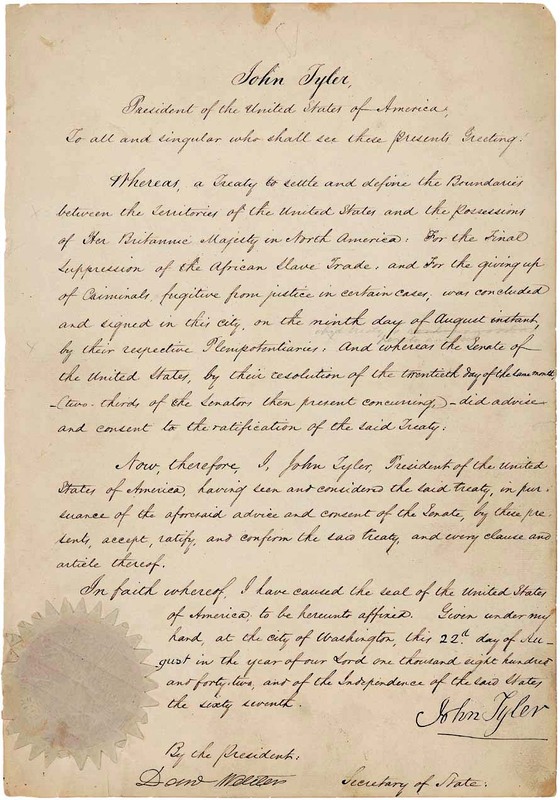 The federal government in Washington not only had to worry about the actions of its people on the borderland, but it also had to worry about how its actions would be interpreted on the international scene, particularly in Great Britain, forcing it to take action along the border to maintain peace. Jean-Paul Bernard, “Vermonters and the Lower Canadian Rebellions of 1837-38,” Vermont History 58, 4 (1990): 250‒263. Andrew Bonthius, “The Patriot War of 1837-1838: Locofocoism With a Gun?” Labour Vol. 52(2003): 9‒43. Maxime Dagenais, “A ‘Canadian Revolution’ in Philadelphia: Philadelphia and the 1837-38 Canadian Rebellion,” American Review of Canadian Studies Vol. 48(2017). Oscar Arvle Kinchen, Rise and Fall of Patriot Hunters: Liberation of Canadian Provinces from British Thraldom (1956). 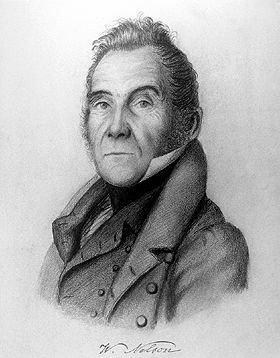 Julien Mauduit, ‘Vrais républicains’ d'Amérique: les patriotes canadiens en exil aux États-Unis (1837-1842),’ PhD diss, Université du Québec à Montréal (2016). Shaun J. McLaughlin,The Patriot War Along the New York-Canada Border (2012). Thomas Richards, Jr., The Texas Moment: Breakaway Republics and Contested Sovereignty in North America, 1836-1846, PhD diss, Temple University (2016). Samuel Watson, “United States Army Officers Fight the ‘Patriot War’: Responses to Filibustering on the Canadian Border, 1837-39,” Journal of the Early Republic, Vol. 18 (1998): 485‒519.